"Temporary or chronic indigestion, gastritis, constipation, lack of appetite, sour burps, intestinal gas, colitis, acid reflux, irritable bowel syndrome (IBS), heartburn, nervous stomach, stomach cramps, intermittent diarrhea, and constipation," from Rosita Arvigo's Ethnobotany of Belize. 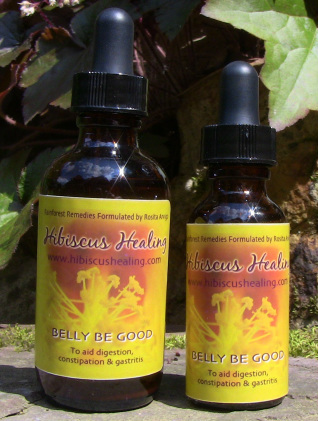 This tincture is for those moments when you feel abdominal cramping, bloating or you ate something that didn't sit right. It specifically aids in digestion, relieves constipation, and moderates gastritis. For more chronic conditions take 10 minutes before every meal. It can even relieve a chronic condition where your intestines are stuck in a spasm. One dose and you could be free from pain! ​It works well for children as well. Please contact me for specific dosage information if you are considering taking this tincture for yourself or your loved ones. I am happy to help you in a Free 15-minute Consultation. *Pregnant and nursing women can use this tincture, but it does not combat morning sickness. ​Use with caution if taking anti-depressant medications. Man Vine, Gineweo, and Guaco. To learn more about Belly Be Good and its many uses check out this Blog Post. Belly Be Good 1 oz. Belly Be Good 2 oz.